Our everyday lives are bettered by visionary inventors, and we were reminded of that on May 2, 2012, when ten new inductees to the National Inventors Hall of Fame were honored by David Kappos, Under Secretary of Commerce for Intellectual Property and Director of the United States Patent and Trademark Office. The 40th annual induction ceremony took place at the Smithsonian American Art Museum and the National Portrait Gallery, the site of the historic Patent Office where the Hall of Fame’s first inductee, Thomas Edison, received his patents. Most of the 2012 honorees were on hand, including Barbara Liskov, whose innovations in the organization of computer programming can be found in almost all modern programming languages; C. Kumar N. Patel, whose carbon dioxide laser developed while at Bell Labs is an essential component in the medical, industrial and military arenas; and Gary Starkweather, who while with the Xerox PARC facility invented the laser printer. They were joined on stage by 21 previous inductees. 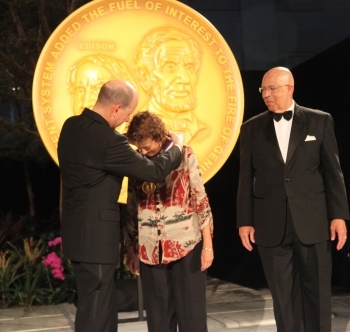 Three honorees were inducted posthumously, including Mária Telkes, known as the “Sun Queen” for her pioneering work in solar energy; and Steve Jobs, whose influence spanned personal computing, film animation, consumer technology, and digital publishing. The National Inventors Hall of Fame is the premier non-profit organization in America dedicated to honoring legendary inventors whose innovations and entrepreneurial endeavors have changed the world. Founded in 1973 by the USPTO and the National Council of Intellectual Property Law Association, the Hall of Fame has 470 inductees with its 2012 induction. You can visit the National Inventors Hall of Fame and Museum in the atrium of the Madison Building on the USPTO campus in Alexandria, Virginia, Monday through Saturday. Admission is free.